One of my favorite things about styling parties is crafting! I love to try out new crafts I haven’t done before, especially if they help me to create party decorations and backdrops that match the theme I am working on. A friend of mine recently had a gorgeous piece of wall art commissioned for her daughter. A rope art backdrop with her daughter’s name written in rope on wood. I thought something like this would be perfect for a barnyard theme party, a rope art backdrop spelling out Happy Birthday. I couldn’t wait to give it a go. I think my DIY version turned out great! What do you think? I’m excited to share the tutorial with you! I was able to get the majority of the craft supplies to make my own rope art backdrop from Oriental Trading’s craft section. They also have all the party staples and décor I used for the barnyard theme party. Look out for the fabulous new range of red gingham products which have become my new favorite. Use a chalk pen (that can be brushed off or removed with a damp cloth) to write out the words. If you are comfortable you can freehand this. Alternatively, print out the words in the size & font (I used “learning curve”) you want before hand. This creates a pattern you can copy from. There are other options, you can use a calligraphy stencil, or use a projector to project words onto the canvas for you to directly overwrite with your chalk pen. Tip: Before you start writing, measure out the words (in the font you want) to ensure they fit your canvas. You can increase or decrease the font size until you get the right fit. I choose the wired jute as it was much easier to bend and position BEFORE having to glue down the jute. You will be able to bend the jute and create the words for your rope art backdrop, cutting where necessary, then restarting again. For example, I created the 1st stroke of the H, cut the jute and then restarted to create the cross bar of the H. When I laid down the third stroke of the H I could flow straight into the a without stopping. Apply glue to the chalked letters and press the cut jute letters down firmly. Take the hanging gingham fans, cut the excess white cardboard off (the piece with holes in it that is used to hang the fans. Then cut the first fold in the fan folds to provide a piece that can attach to the edge of the canvas. Fold the fan to a 1/4 or a 1/2 depending on the placement (1/2’s are placed at the center of the canvas top and bottom. 1/4’s are placed at each corner of the canvas) Use the glue gun to attach the last fold of the fan to the edge of the canvas. Apply hot glue to the backside edges of the steer head. Gently press against the 1/2 sized gingham fans (top and bottom middle). Once dry, you can make this even more secure. Use the staple gun to adhere the plastic tag at the top of the steer head to the edge of the canvas. You now have a rope art backdrop complete with gingham and steer embellishments. 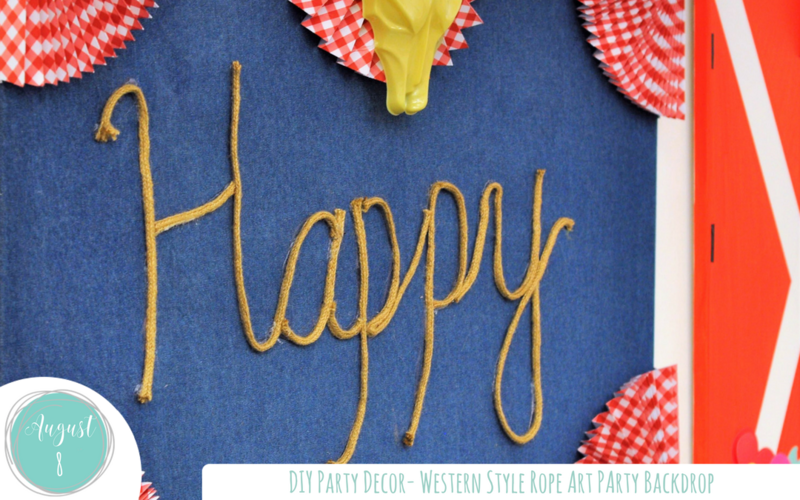 This is a fun DIY rope art backdrop that is perfect for any farm or western party. You can personalize with your guest of honors name or create any number of personal messages. Either create the entire DIY rope art backdrop or use parts of this DIY. Customize them to fit your party, try adding the rope word art to a wood backdrop or perhaps you’d like to make a banner out of the 1/2 size gingham fans and string them across your backdrop. Planning a western or barnyard party? Make sure to check out our barnyard theme party for more inspiration to help you make your celebration a magical and whimsical one.